Sunset was still more than three hours away, but the light was fading fast outside the little window to my room. I shut down my computer, slipped into my bicycle shoes and a rain jacket, and threw my fleece jacket, a scarf and a hat into the pannier. It was still warm, because the clouds had only just rolled in. 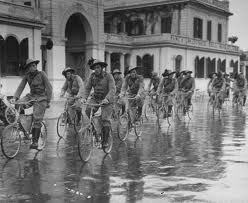 Riding in the rain is nothing new: Italian bersaglieri soldiers in World War I. The first gentle rain drops began as I rolled out of the driveway. Two blocks later, it was a steady rain. One kilometer after that, the downpour was sliding off my rain jacket and soaking my pants and shoes. I rode only 3 km to First Presbyterian Church, but I might as well have swum there. 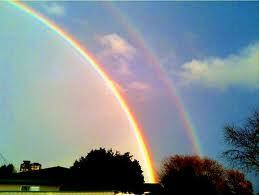 As I expected from checking the weather map, the front passed quickly. During the two-hour rehearsal for Alexander Nevsky, everything dried off except my shoes. It was dark when I stepped out from that rehearsal to ride to St. Paul Memorial Church for Chancel Choir rehearsal. A 20-knot headwind was blowing out of the West, and the temperature had dropped to just a few degrees above freezing. After the second rehearsal, it was well below freezing, but at least I was riding north, with the wind abeam. I had to take the whole lane to be ready for the gusts that might blow out of driveways or spaces in the trees. My shoes were still soaking wet from the squall five hours earlier. My cozy bed never felt so good as it did that night. The next day stayed near freezing all day, so I layered with a lightweight fleece hoodie underneath my regular bicycle jacket. I was grateful that the Italian book club meeting was so close to the house. In just the last week, the temperatures have ranged from 25°C to -7°C. We have had calm days and gales, but mercifully no snow. Riding through it all, I have been grateful that I was not riding from one town to the next. I have also been pleased to notice that the hills here are as easy to climb as they were before I left. Obviously the Southern Swing 2013 did not leave me weaker for having been so flat. Cousin Michele and others asked me that, and you deserve an answer. I could shrug and say, “I don’t know,” but that would not be true. The bicycle does give me time to think, and sometimes I think about this question. Of course, it’s fun. That does not always mean that it is pleasant or comfortable. But I do derive great satisfaction both from the feel of riding a pleasant road and the accomplishment of getting where I am going under my own power. The fun of bicycling goes back to my childhood, when the bicycle gave me mobility and independence, and the ability to explore any place that I could reach in the two hours or so every afternoon before my mother came home from work. Later it allowed me to hold down jobs after school, to go to friends’ houses to do homework, and to socialize where my friends met, which was never in my neighborhood. 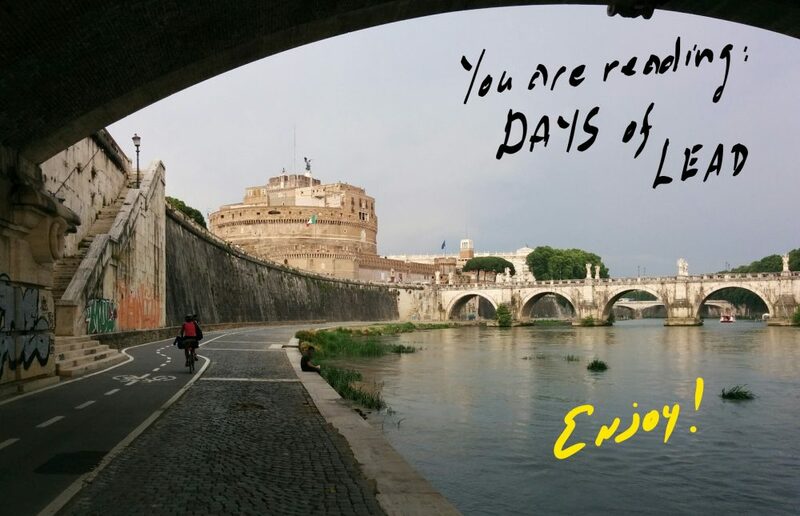 I never lost the excitement of growing up in Rome, and making my way among the cars, motor scooters, motorcycles, trucks, handcarts, horses, mules, and pedestrians that clog the streets of Old World capitals. So why do I ride in lousy weather? Why do I ride when I’m sick? Well, maybe it’s the same reason that I enjoyed frostbite sailing at the Naval Academy. It’s one thing to take a fine sailboat for a cruise on the Chesapeake Bay when the sun is shining. It takes a different kind of sailor to check out a 12-foot open sloop, and race among the ice floes and sleet. 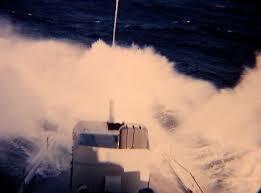 After the Naval Academy, I joined the surface Navy, specifically cruisers and destroyers, because I wanted salt spray in my face and water over the bow. I wanted to pull liberty in the little ports, where the aircraft carrier could not go. It does not hurt that riding a bicycle is about the greenest thing I could do. But I have to admit that if I did not enjoy it so much, my environmental consciousness would not have gotten me through the Southern Swing 2013. As an engineer by training, I can appreciate the fact that the bicycle is the most efficient form of personal transportation there is. I have certainly proven that with the numbers. It costs me less than USD1000 a year to operate my bicycle. It costs me USD1300 a year to own a car. I ride 10,000 km per year on my bicycle; less than 5,000 km in my car even while was living in Charlottesville. The bicycle keeps me alive. My health team agrees unanimously that riding has saved my life more than once. Not just the practice that allows me to dodge crashes with automobiles, but the general good health and immunity that allows me to recover quickly from injury and disease. That this cardiac patient with prostate cancer can look forward to each day with joy and expectation is in no small way the result of the cycling lifestyle. I hate exercise and workouts. Without the bicycle, there is no way that I would have been able to maintain my health all these years. And then, the bicycle gives me hope. For every cold, rainy headwind, for every bumpy, broken road, for every impossible hill, there is a smooth, level highway and a stiff tailwind somewhere up ahead. I know this, and that is why I ride. This entry was posted in bicycling, Southern Swing 2013 by JT Hine. Bookmark the permalink. Thank you for sharing your heart and your story, Jonathan. Just fascinating! I have read recently that there must be physical activity along with new mental challenges to preserve memory and stay off dementia. What a treat that in riding, you are saving your memories and adventures to share with us. (I enjoy the pics, too.) Thank you, Jonathan!